I’m sure you’ve heard all about probiotics – the beneficial bacteria that help keep our gut and digestion in top condition. Chances are you can name probiotic rich foods, like yoghurt, sauerkraut and kefir. Less well known, but equally as important, are prebiotics. Prebiotics are a non-digestable type of fibre found in certain foods. Simply explained they’re the food or fuel that allow probiotics to work their magic. Probiotics introduce desirable bacteria into our intestines and prebiotics ‘feed’ this good bacteria. Diets rich in prebiotics have been linked not just to better digestion and gut health but also to lower inflammation and even strengthened immunity. There’s plenty of material online that explains all of this if you’re keen to know more. But right now you’re possibly wondering ‘So which foods are packed with prebiotics?’ You’ll be glad to here that plenty of common foods are rich in prebiotics. Like asparagus, Jerusalem artichokes, raw garlic, under ripe bananas and raw or cooked onions. My personal top prebiotic pick has got to be onions – for their accessibility, affordability and versatility. Barely a day goes by when I don’t have at least one meal with onions involved. So when I came across a simple method for fermenting onions using only salt and vinegar I had to give it a go. The method that follows is sugar-free and requires only three staple ingredients. And because onion relish pairs well with all kinds of dishes this foolproof recipe gives you an easy way to get a prebiotic fix! To make around 800g of relish you’ll need 6-8 medium onions, 4tsp Himalayan salt and 4tbsp apple cider vinegar. Peel and chop the onions into quarters (I used red onions but any onions should work well). Spread the onion quarters in a baking dish, without overlapping them. Cover the dish with foil and roast the onions for an hour in an oven that’s been pre-heated to 200C. Allow the onions to cool slightly and finely chop them. Add the vinegar and salt and mix well. Transfer the mixture into a sterilised jar. Allow the relish to ferment in a dark spot at room temperature for around 24 hours. Transfer the relish to the fridge where it will keep for a week or more. 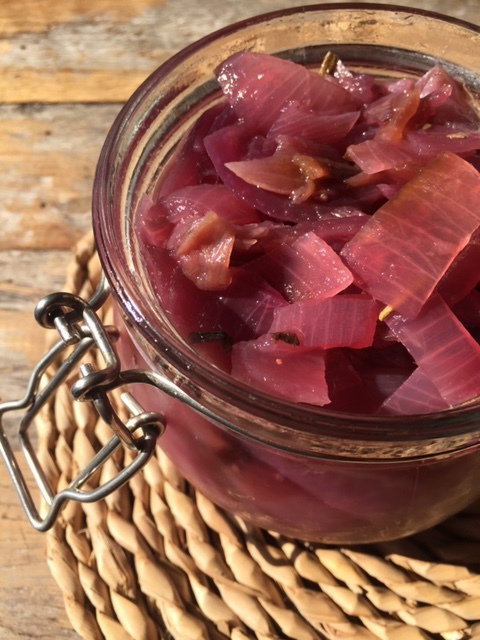 That’s all there is to it – fermented, sugar free prebiotic packed onion relish! Tags: onion, prebiotics, relish, sugar free. Bookmark the permalink. Love this… it’s always in my fridge. I make a new batch every week! Only I use lemon juice… but will try with with apple cider vinegar soon! That’s great to hear Annika – lemon juice is something for me to try next time. I think it’s always going to be in my fridge too! I made a jar of this immediately after our Instagram discussion and we’re still eating it 😊😊😊 I love it! I chopped my onions finer than yours but otherwise I did exactly as you said…and I’ll be making more very soon! I’m just so happy to be able to make a red onion relish without ALL THAT SUGAR!!!! Red onions are sweet enough! I am going to make it this weekend, what a great idea. I can imagine using these many ways. Thank you…and no sugar, fabulous! Keep me posted Liz on how it goes – I’m sure that like me once you’ve made it once it will become a regular in your kitchen! What a fantastic recipe, Laura. I love making relishes and I love onions. Like you I use them so much in cooking without even thinking about it. This looks so easy and tasty. Will have to try. 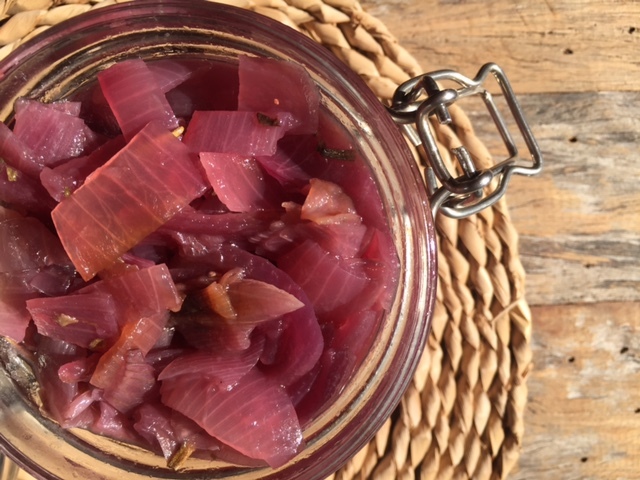 Thank you Tracey – as a fellow onion an I’m sure you will love this relish! Very informative post! Thanks for this beautiful share Laura. Love, love fermented foods. And this recipe looks like a keeper! Thank you Christina and yes it is a keeper – I am shortly about to make my third batch! I could imagine eating this delish and healthy onion pickle with all kinds of things, but what immediately springs to mind is cheddar! I would add this to a cheese board. Cheese and onion anything is always so good! Laura, I love onions on everything! I make the quickly pickled ones with Indian curries. I am definitely making these so I can have them handy in the refrigerator. Good information on the prebiotics too. Loved the post! Whoa! This looks so good! And that was a lot of good info too! Thank you! 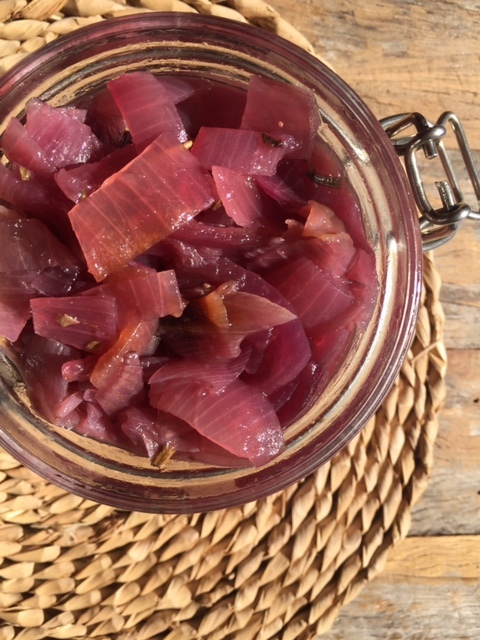 Thanks Nell and hopefully you learnt a little something about prebiotics – good to see onion feature in your latest recipe…. I will that sounds delicious! Thanks Mollie – hopefully my quick summary convinced you that your love of red onions is a great one! I have been eating sauerkraut almost daily and have been toying with the idea that I should make something fermented. This recipe is so incredibly easy. I will have to give it a go as it is truly versatile. Thank you! I couldn’t agree more – I now have a constant supply of this and sauerkraut in my fridge – and watch out for my next post on sauerkraut spice mixes! Sounds wonderful! Looking forward to it! I have been looking for a good probiotics recipe that does not include cabbage and this one seems about right. I will definitely going to make it x Thank you so much for sharing! Thanks so much – I’m glad and please do keep me posted on how it turns out and share any feedback! Looking forwards to following your blog as well….